DCCF Chairman Chris Thomas (front left) and founder Eve Went (from right) receive a cheque from Jude Castell (front centre) and Caterpillar staff who have raised almost £30K for the local cancer charity. 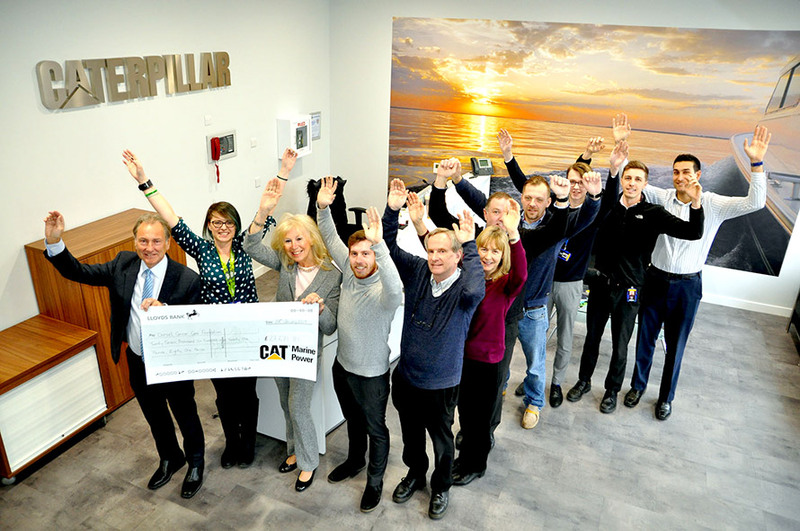 WHEN staff at Caterpillar Marine Power UK Ltd in Ferndown pledged to support a local cancer charity, they had no idea of just how far they would go. Four years on they have run marathons, biked, bowled, pulled a 35,000kg aeroplane along a runway and even lost hair – raising almost £30,000 for Dorset Cancer Care Foundation (DCCF) in the process. The fundraisers unveiled their final, fundraising total of £27,671.81 in a special presentation to DCCF founder Eve Went and Chairman Chris Thomas. Caterpillar Marine Power UK Ltd is a division of the global brand Caterpillar. The company, based at Ferndown Industrial Estate is the leading manufacturer of marine generators and propulsion engines. Jude met Steve Jewell, a self-employed plumber from Broadstone, who was struggling to pay his mortgage while going through cancer treatment. “I’m not ashamed to say I was moved to tears when he told me how our fundraising had helped his family through some very dark times,” said Jude. Dorset Cancer Care Foundation was set up in 2012 and gives grants to families experiencing financial struggles because of cancer. DCCF grants are often used to meet household and transport costs, buy specialist equipment and pay for much-needed short breaks. The charity’s co-founder Eve Went said: “The Caterpillar team came to us in 2014 as fundraisers and they have gone on to become much-loved friends. DCCF, whose patrons include AFC Bournemouth Chairman Jeff Mostyn and Harry Redknapp, is currently running the High Five Appeal, which asks people to donate a fiver by texting DCCF00 £5 to 70070. DCCF would also like to hear from Dorset cancer patients who might need its support. An application is simple and if successful, financial help is available very quickly. Details of how to apply for grants and become a supporter of DCCF can be found here. Sunday Social Raises over £1000!